Scoliosis is an abnormal sideways curve of the spine. The cause is usually unknown. From the rear, the healthy spine should look straight. When a person has scoliosis, they have an abnormal sideways curve that makes the spine look tilted when viewed from the rear. Scoliosis tends to develop in late childhood. About one in every two people is thought to have mild scoliosis, which is painless, does not worsen and does not need treatment. 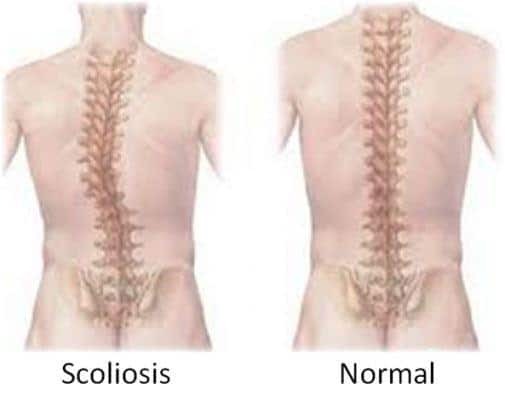 However, severe scoliosis is a painful and debilitating condition that tends to worsen with age. About three children out of every 1000 have scoliosis that needs medical treatment. The surgery rate is approximately one per thousand. The angle of the curve. Physiotherapy exercises are aimed at maintaining and improving the spinal range of movement, while also strengthening the specific postural stabiliser musculature. If you would like to discuss scoliosis regarding physiotherapy please feel free to contact your local physiotherapist if you have any questions.